I love congee boiled from scratch but that usually takes at least one hour to cook. Sometime I just want some really quick. This is a super quick version. Great to use up some left over rice lurking in the fridge. This recipe will make 2 big noodle soup bowls. Better than any instant ramen or quick noodles! Yum. My family do this for Sunday brunch sometimes - they add prawns and have dishes of chilli minced with garlic and fish sauce, and big bowls of coriander. Makes you stink, but it is so delicious. Nice isn't it. If you add some chopped up crispy 'yau cha kwai'(chinese crueller bread sticks), that is even better adding to the rice soup. Crisy wonton pastry is also great with rice soup, just cut wonton pastry into strips, deep fried and sprinkle on rice soup, yum yum yum! Both excellent ideas - Have you made yau tsa gwai at home before? Yes a long time ago. I was just thinking the other day maybe to try again. Will let you know. Hi again. 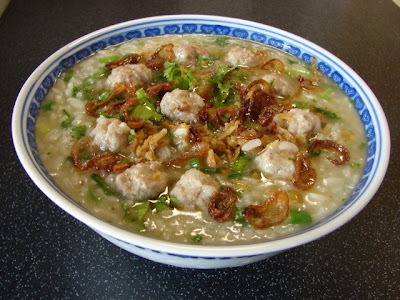 Would really love if you could post your recipe for chinese crueller, those crispy bread you topped on congee and it also goes well with soy milk. Sis made this a couple of days ago, but the ammonium bicarbonate from the recipe really stinks after you bite !!!! We've tried baking it afterwards, but still the ammonia scent lingers aaargh. So frustrating. Thank you. Hi Ammonium bicar does stink. Most of the recipes I found use too much and the other no so safe chimical in many traditional recipes uses alum so the cruellers stay crispy. My recipe isn't traditional with all these nasty chemicals so it is not super spongy and crispy, still ok. If you like I will make a batch soon and post it.